2016 May « Secat, Inc.
Sharon M. Louden is an artist, educator, editor of the “Living and Sustaining a Creative Live” series of books and advocate for artists. Please visit http://www.sharonLouden.com to discover her extensive resume and body of work. Creating with aluminum is just one of the artist’s talents. “Merge” is a permanent, site-specific installation spanning portions of Oak Hall on the campus of University of Connecticut, Storrs, CT. Extending from the first and second floors of the north lobby into the south lobby, the sculpture is an organically flowing river of shiny aluminum. Appearing as if it comes from nature, the man-made material implies constant movement while reflecting the changing light throughout the day and night. Over 100,000 polished (raw), brushed (matte), &amp; colored aluminum, sizes variable: 1×7″, 1.5×10″, 2.5×13″, 3×19″, 4×24″, 5×13″ and 24×75″; 10,000 steel screw fasteners. The work flooded the museum space with reflected light, creating a river of aluminum as a “drawing in space”. Secat is excited to announce that a unique high temperature furnace has been added to its MTS-810 tensiletesting machine, and will be operational by the end of April 2016. The furnace utilizes two heating zones in the temperature range of 100-1400 degrees C (212-2552 F). This temperature range covers the thermal processing of awide range of materials such as aluminum, magnesium, copper, steel, etc. The two heating zones can be controlled separately and are able to mimic material manufactured in a non-stable high temperature environment, i.e. hot-rolling and hot extrusion. Due to deformation and friction, the temperature will increase during extrusion, and could increase or decrease after hot-rolling based on mill situation and rolling pass reduction. The working height of the furnace is 86 mm (3.4 in), which is ideal for various mechanical tests including tension, compression, and fatigue at elevated temperatures. 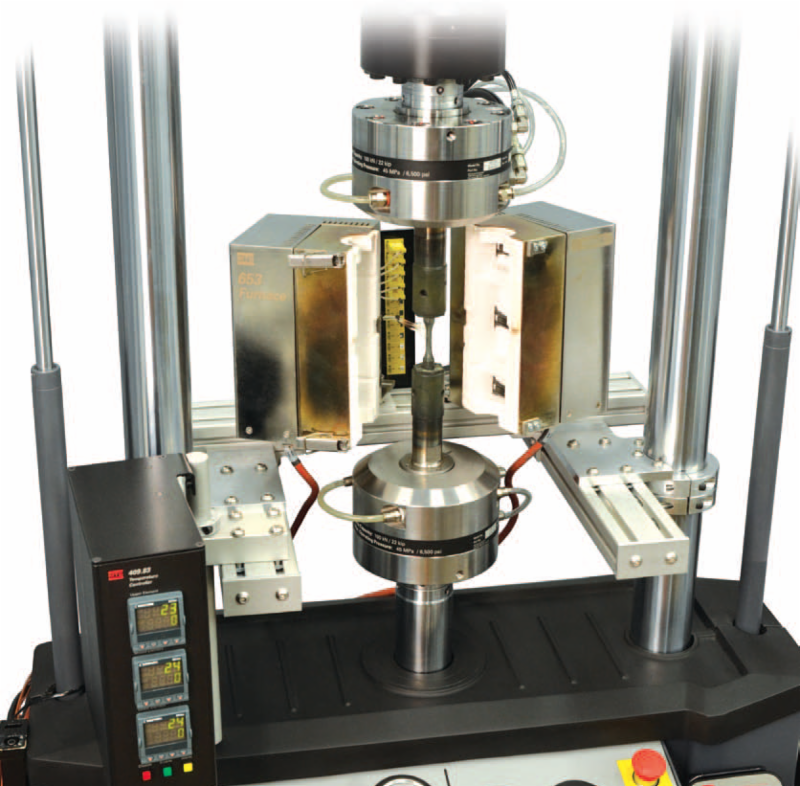 Fig 1 shows the high temperature test fixture for tension testing. Engineering materials normally undergo thermo-mechanical processes, such as hot or warm forming, extrusion,forging, etc to make the final product. Due to the critical transformation that occurs during the thermo-mechanical process, including phase transformation, dynamic recovery and recrystallization, it is important to understand the material behavior at high temperatures prior to developing the manufacturing processes. This will enable control of the final product properties including grain size, particle/precipitate, strength, formability and corrosion. It is essential to understand the interaction between stress and strain during deformation in a high temperature working environment. The high temperature test unit (Model 653.02) features are shown below in Table 1. The Eleventh Annual International Aluminum Technology Seminar & Exposition (ET ’16) was held May 2-6 in Chicago, Illinois. The conference was attended by more than 1,200 people within the aluminum extrusion industry. The conference featured 120 technical and management presentations from industry and academic participants as well as an exposition hall showcasing products and services from 120 suppliers. Secat participated in the three-day exposition, presenting its analytical capabilities to aluminum extruders, billet casting companies, and industry suppliers. 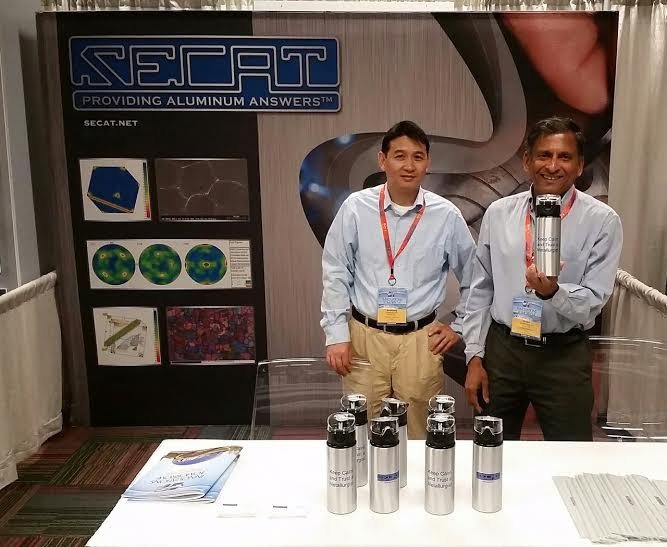 The photo below shows Shridas Ningileri (VP Engineering) and Dr. Quancang Ma (Materials Engineer) in front of the Secat display booth. Presentations were divided into six tracks consisting of Billet Process and Equipment, Theoretical Extrusions Process, Extrusions Equipment, Management Issues, Extrusions Process, and Value-Added Processes. The tracks were sub-divided into several categories such as Anodizing, Die Design, Billet Casting, Operations, Melting & Homogenization, etc. The technical sessions were led by industry experts. A few interesting topics presented during the conference are discussed below. Inverse segregation zone (ISZ) is common in the cast billet that usually results in alloying elements (e.g. Si, Mg, Fe, etc.) segregation at the billet surface. The ISZ distance normally varies with casting process parameters and alloy chemistry. An increase in ISZ can effect extrusion profile surface quality. Increasing homogenization temperature can permit a reduction in holding time and increase the phase transformation of beta to alpha. However, higher homogenization temperature could cause re-melt of the ISZ. Thus, control of the ISZ thickness is critical in controlling billet quality. One presentation discussed a Low Pressure Cast (LPC) technique to reduce the billet ISZ where the liquid level is kept low in the cast mold, and may be as low as the launder liquid level. Examples were discussed where normal ~80 µm ISZ in the 200 mm diameter AA6XXX billet decreased to ~20µm after application of this method. Hard alloy AA7075 with a normal ISZ of ~400 µm for 16″ diameter billet can be reduced to near zero using LPC with an improved cast billet surface. The melting point of ISZ is lower than matrix without ISZ and therefore minimizing ISZ would increase the melting point of the billet at the surface. Therefore there is a possibility to increase homogenization temperatures. Another paper discussed the use of Al-Ti-C Al grain refiner as an alternate to classic Al-Ti-B. The paper discussed the use of Al-Ti-C during the production of AA6063 7″ diameter industrial billets. THe feed rate, grain size, die wear and extrusion surface quality data was presented and compared with the product made using Al-Ti-B. The data showed that the grain size (~127 µm) of the billet with a feed rate of 1.8 kg/ton rate of Al-Ti-C was similar to billet produced using 3 kg/ton of Al-Ti-B. In addition, the extrusion surface quality was reported to be better than Al-Ti-B, with the die lifespan increased by ~40-70% using Al-Ti-C for the given extrusion profile. The occurrence of blisters in the extrusion profile was discussed in another paper. Blisters are common and can occur in extrusions due to several causes. Potential causes could include entrapped hydrogen, shrinkage, surface contamination, moisture in the table or in refractory materials, high environmental humidity, inadequate degassing and/or press processes. The presentation discussed sixteen causes that could result in blisters. Besides the common causes of blisters, one idea was that there existed an ideal extrusion upset pressure and if it was not maintained, the potential for blisters to form was possible. In this case, the blister was the air that was entrapped in the profile during extrusion. Normally, there is a ~10% void between container and billet during the extrusion process. If the upset pressure is too low, void/air would be squeezed into the extrusion and blisters could form. The presentation noted that different profile shapes had different potential for blister occurrence with ideal upset pressures. Due to the increasing demand for aluminum extrusions in the automotive industry, the properties of heat-treatable AA6XXX and non-heat-treatable AA5XXX alloys has attracted a great deal of attention due to their great potential usage in vehicles. One presentation discussed the comparative properties of AA6063 T6 and T7 temper. It was indicated that AA6063 T7 may be more attractive than T6 as T7 has shown better crashworthiness. T7 which is slightly overaged temper, has slightly lower strength by ~16-19% YS and ~13-15% UTS than T6 with similar elongation (El=12%). However, T7 has 2-3 times the crash fracture strain of T6 material. The reason for this difference was ascribed to the possible particle free zone (PFZ) along grain boundaries due to over-aging. MagStir™, the world’s first permanent magnet stirrer for molten aluminum was introduced by Zmag,Ltd. (Japan) in 2004,followed by the Typhoon™ chip melter and all oyerin 2009. Over 100 systems have been installed and are running around the globe at small cast houses aswell as global primary and secondary aluminum producers. However, misunderstandings and misconceptions persist with regard to these technologies, so this article addresses some of the most commonly asked inquires. Q: What are Zmag’s MagStir and Typhoon? A: Mag Stir is the world’s first and only permanent magnet stirrer to circulate molten aluminum. Typhoon is the world’s first and only permanent magnet aluminum chip submerging system.Both Mag Stir and Typhoon are powered by the zPMC™. Q: What is the zPMC? A: Zmag Permanent Magnetic Circuit, aproprietary technology Zmag has developed and designed to move molten aluminum. Q: Do you need electricity to generate magnetic fields as a traditional EMS(ElectromagneticStirrer) does? A: No. The zPMC is a “permanent” magnetic circuit. The magnetic field exists naturally as a function of the design, without requiring electricity. Q: Then, why do Mag Stir and Typhoon need electricity? A: A small amount of electricity, as low as 3kW/h (4HP) and up to 2 0+kW/h (27HP),is used to rotate the zPMC via a gear motor. Electricity is also required to run a small air blower (2.2kWor3HP) which protects the zPMC from molten aluminum heat. Q: Similar to a traditional EMS, do you need components like a transformer, a frequency convertor, piping, a complex control panel, and fine installation tolerances to run the MagStir/Typhoon? A: No.The control panel is compact and simple, and many customers integrate the MagStir/Typhoon control functions into their furnace control panels. The MagStir/Typhoon does not require a PLC.The zPMC is turned with a simple inverter control. Q: What are molten metal flows in comparison with EMS? A: The largest flow rate of the Mag Stir observed (todate) is over 90T(about200,000LBS) per minute. Most furnaces do not require this level of circulation; however, the MagStir is customized to meet customers’ needs. 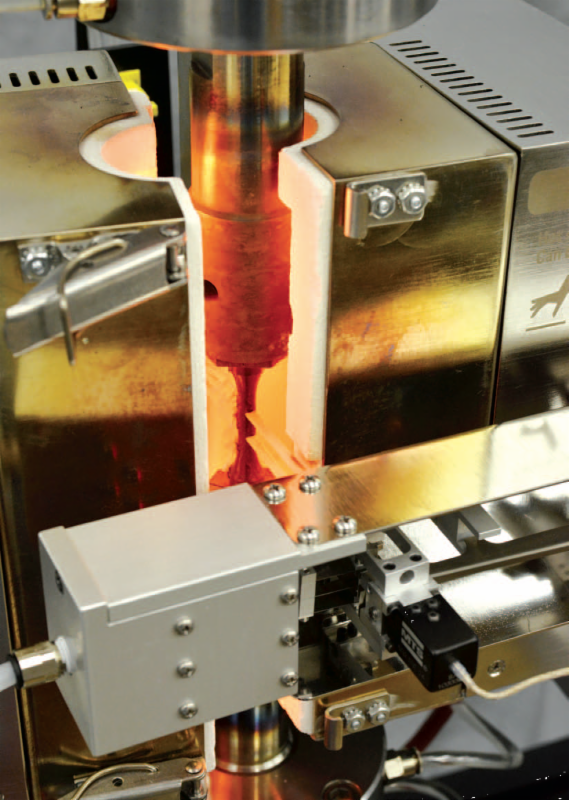 An EMS generates wave motions when moving molten aluminum where as the MagStir is designed to quietly move a large amount of molten aluminum under the molten aluminum surface skin.By doing this,the Mag Stir ensures to minimize a chance of oxidizing molten aluminum while maximizing heat transfer efficiency. Customers can flexibly change flow rates and direction (e.g. clockwise and counterclockwise) of molten aluminum via the inverter. Q: What is the estimated life of th ezPMC? A: If the air blower is running all the time to protect the zPMC from heat from molten aluminum, there is really no noticeable performance loss over a long period of time.The zPMC does not generate heat in its permanent magnetic circuit and only needs to be protected from molten aluminum heat. Q: What is a typical operational temperature? A: This varies among operations,however, it is typically between 35 degrees Celsius and 85 degreesCelsius(95-185Fahrenheit). The MagStir/Typhoon control panel is preset to send a warning if an ambient temperature of the zPMC hits100degreesCelsius(212Fahrenheit). In this case,operators should confirm that the air blower is running properly. A: Maintenance requirements are so low that Zmag needs to remind its customers to check the system. Bearings need to be lubricated,and the gear motor oil should be changed on a periodic basis. Since the zPMC turns slowly (typically up to 60RPM), little stress is placed on the bearings. Q: What about magnetic field safety? A: The zPMC is designed to focus towards molten aluminum. Other directions are magnetically-shielded, to roughly the level of a kitchen magnets strength. However operators with a medical device implant should not approach the vicinity of the MagStir/Typhoon. Watches, credit cards, and other magnetically-affected materials should also be kept away from the MagStir/Typhoon. Q: Can we retro fit the MagStir/Typhoon to our furnaces? A: Yes. Each MagStir/Typhoon is customized to meet specific objectives of customers and can be retro fitted to various types of furnaces. Q:What benefits should I expect to see if Iuse zPMC-powered products at my plant? A:Since every customer’s objectives, furnace configuration and operation are different, Zmag does not make specific claims about the benefits of MagStir and Typhoon. However ,below is are ference courtesy of Rio Tinto’s Pacific Aluminium New Zealand Aluminium Smelters. Drop in dross generation: 25% conservatively across heavily alloyed product. 50% reduction in the skimming and stirring time for alloy additions compared to manual stirring. Extended refractory life between major refractory rebuilds. Reduction in operating costs such as fork lifts and manual stirring tools as well as reduction in personnel safety risk. Reduction in fuel by 7% (and associated CO2 emissions). Consistent and predictable product quality through improved alloying capability, especially in Ti recoveries as well as significan treduction in magnesium burning on molten aluminum surface. Improved temperature homogeneity with top to bottom temperature differential constantly at +/-2 degrees from its set-point. Reduction in the likelihood of temperature related casting defects by having the temperature constant against depth of the metal in the furnace. Improved melt quality in the furnace resulted in a significant increase in the product quality as the product is not as susceptible to inclusions,dross entrapment or spinel generation. Constant stirring has increased some alloy code casting from 6 to 7 casts in a 24hrday (a 16.7% increase). For more information, please contact Todd Boggess attboggess@secat.net or 859-514-4989. I grew up in the small town of Potosi, Missouri. Growing up I always had a passion for math and science and decided to attend the University of Missouri – Rolla where I graduated with a B.S. in Metallurgical Engineering in 2002. The majority of my work experience is in flat rolled sheet (aluminum and steel). I have worked for Wise Alloys, U.S. Steel, Crown Holdings, and Novelis. I am currently working for Aleris in Lewisport, KY where I am one of the Product Engineers in the Product Technology department. Very exciting times in Lewisport with the current expansion of the facilities and the new products it will bring. I have been married now for almost 10 years and have two beautiful children. I enjoy outdoor activities like camping, canoeing, and hiking. As a product engineer I am responsible for the metallurgical practices for the various products. These practices are ultimately the “recipes” for how to process the aluminum through the plant from casting through finishing to achieve the metallurgical characteristics and mechanical properties required by our customers. I work with the process engineers and operations on our processes to optimize these practices. I also work with our customers to ensure proper material selection for their product and trouble shooting and analysis on any problem material. 2) What are some things that happen for you in a typical day at work? Every day seems to bring something new. Some days are filled with running trials out in the plant and evaluating the outcomes. Some days are filled with analyzing data and trying to make process or practice improvements for a customer or certain product. 3) How does your job impact the markets you serve? We want to ensure that we create a “recipe” for each of our products that provides consistent quality results to our customer every time. We want to provide solutions and support for our customer needs and inquiries. 4) How do you interact with Secat, Inc. and how does the relationship benefit you? I interact with Secat on a regular basis for material analysis both on internal related mill issues and on customer inquiries. We rely on Secat’s longstanding experience and expertise to aid in root cause analysis and long term projects and studies. 5) Tell us something about yourself (outside of the industry) that people may not know. I love to run! I have run four half marathons and fulfilled my dream of finishing a full marathon this past October. For more information on the products and services that Secat provides, please contact Todd Boggess at tboggess@secat.net or 859-514-4989.
tempers and designations of aluminum along with commercial factors that influence buying behavior. The course allows operators and engineers to apply what was learned in the classroom directly to their job, thus improving their knowledge and increasing productivity. The course was highly interactive with a lot of discussions between the employees and the trainers focused on specific questions related to the practices at the plant and how process and product improvements could be made focusing on continuous improvement. Thank you to Skana Aluminum for their hospitality and participation! If you would also like to host a private class at your plant, please contact Todd Boggess at tboggess@secat.net or call him at 859-514-4989.